The speed and accuracy of computers are something the human brain can no longer match. Simply put, computers are faster, more consistent and more accurate than we are. Their ability to reason on certain projects or types of assessment may be compromised, however in our wonderful standardized testing society, government and administration is more concerned with data than the creative growth of our students (sidebar: as an art teacher, I am appalled that I just had to write that sentence). The computer systems that run video games are better, or at least faster, at storing and analyzing data as well as giving instant feedback. If you have taught professionally, you are well aware that any amount of time longer than thirty seconds after a test is taken is too long to know the score for the average student. Students want immediate feedback. This rings especially true when they can go home, play a level on a video game and be told during play if they are meeting their goals or not. This is not something we as educators can do. Imagine being able to correct a student at each step of a math problem before they went on. Not only would this be more beneficial to the students learning process, it would severely reduce the student’s frustration of doing an entire page of homework incorrectly and not finding out their work was useless until the next day. The speed and frequency of feedback can have a direct impact on student learning, and video games have a huge leg up on the human brain. Let’s face it: even bad video games are usually more entertaining than even your best lecture. This is not entirely your fault. As teachers, we have been given a very strict guideline of what we need to teach (i.e. whatever material is conveniently located on the most recent standardized test put out by your state). Many successful video games are not curriculum based ‘edutainment’ type games (see: Math Blaster). The most popular video games are those out in the market that greatly increase the social, spatial and cognitive skills of our students but are based around topics that are much more entertaining such as war, sports or sci-fi events. When it comes to nailing down curriculum, often times ‘edutainment’ games fall into the same boring category as our lecturing; however, ask any kid, in any school, anywhere and they will pick a boring game over your lecture. Why? The answer is most likely because games are very personal. Students have the desire to interact at their own pace and progress naturally as an individual as opposed to being roped into the group standardized learning plateaus of a classroom. Children feel more comfortable with games and enjoy the break from the monotonous, prison-like system of our compulsory school day. Even repetitive board races or mock-Jeopardy games are more exciting than listening to fifty straight minutes of someone speaking. Video games of all types essentially offer students a breath of fresh air from…well, us. This one is the real kicker. Video games and technology in general live or die by the sword of being able to update. Conversely, education has remained unchanged in its form since its inception as an experiment in the mid 1800’s. Why are we so rigid and unchanging? It probably has a lot to do with our fear of failure in education, which in turn, probably comes from the fact that we are dealing with the livelihood of our children. However, in technology, those who do not change and adapt, fade away. Some say the failure to change comes from a lack of funding or the fact that schools are public entities as opposed to a private sector corporation. I think all of these things have a little piece in the giant puzzle of why we in the educational system are so bad at change. Many critics blame old, stubborn teachers, and I will not try to convince you that those teachers don’t exist (I know a few). But let me reassure you that those teachers are not the majority, and they are certainly not driving the hypothetical bus of change or lack thereof. Education refuses to change primarily because we cannot find or agree upon one good way to change it. There is no master CEO of the educational world that will be able to shoulder the responsibility of changing an entire public sector beast as large as public education. Or someone bold enough to withstand a failure while trying. And, if there was, the transition could not be done during said person’s term in power. Maybe it is time to start looking around for a new way. Small, private and charter schools are seeing success in limited markets as they mimic the business model of the private sector: that is, when something doesn’t work, change and adapt. New ideas and fresh opinions are coveted at these schools as opposed to rigid guidelines and stale curriculum. Now, the real problem lies in our endgame. As educators we are stuck preparing students for what our district, state and country believes is best for them. Too often we are creating students for data purposes that are ‘ready’ for higher education at the expense of the trades. We have lost the concept of apprenticeship. We have decided what is right for students with no feedback from our “target audience”. This is what video games and technology excel at. They want to know what they are doing wrong so that, next time, they can release a better version that is more entertaining/useful/powerful. Does this sound like any school you have ever worked in? I didn’t think so. Maybe it is time for a shift in education. Maybe we need to update not only the machines that are helping educate our children, but maybe we need to update our concepts of what education is and should be. Don’t worry, for these three reasons that video games are better teachers than teachers; there are hundreds that make you a better teacher than video games. However you have been warned: video games are continually updating quickly! Thanks for the post and the links. I am designing a summer camp around game design for middle school kids, so I am trying to immerse myself into the world of gaming and education. “target audience”. This is what video games and technology excel at. I wonder if education will ever truly make this shift? 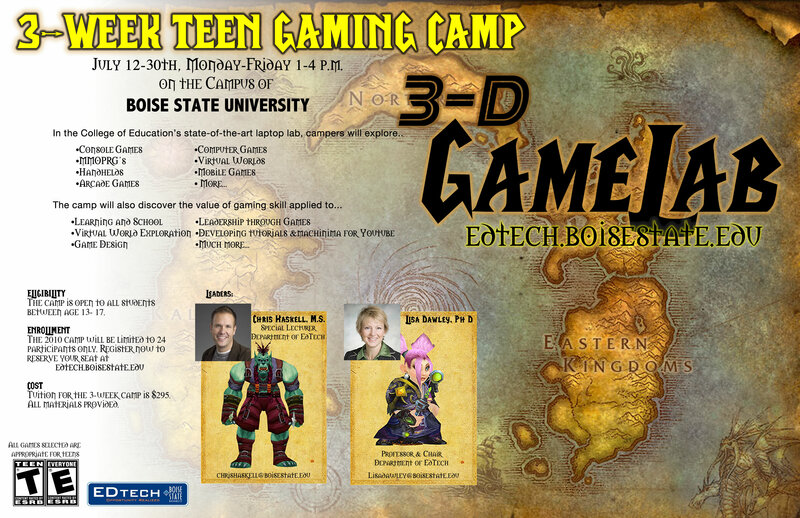 Have you looked into the research regarding games and other educational technology? I was surprised and disappointed that most research shows know statistical difference between using technology and traditional classroom teaching. I keep looking for research that says something different, but I haven’t found any yet. I know there is a ton of research on the subject, but I think its effectiveness in a particular area changes with contents. Personally, I teach art both digitally and traditionally. I will tell you personally that even in some of my traditional mediums, technology has allowed me to greatly increase the amount of knowledge accessed in my class. Besides the amount of knowledge that is now available through technology, the speed with which that information is brought to the classroom is greatly increased as well. Finally, I would say that the fact that we are talking about this over a technological medium (computers, internet, this site) shows us that we are using technology to increase our knowledge and better our teaching, which has to be paying off with our students learning. In my opinion these are only a few ways in which technology assists education, I’m sure by exploring this site, we could find many more! Thanks for the comment.